Entries from various authors about Jan Balet, his works, his website, Jan Balet Art Preservation LLC, and other items of interest. Join us at the Chronicle Book Fair on Sunday, November 4th at the Queensbury Hotel, Glens Falls, NY. 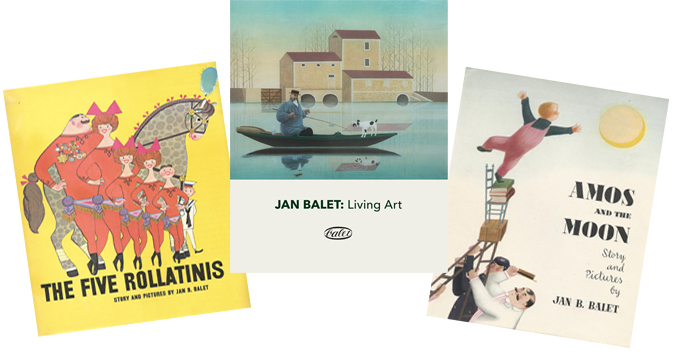 We will have available our newly released book, Jan Balet: Living Art, along with two of Balet’s republished children’s books, Amos and the Moon and The Five Rollatinis. Amos and the Moon - Chock-full of charm and whimsy, this 1948 title tells a simple, endearing tale of a curious little lad on his search for the moon come daylight. Originally intended as a Christmas present for his son, Balet’s book became a gift to many more children; and now in its reissue edition, this vintage title will surely delight a new generation of young readers worldwide. The Five Rollatinis - With no room remaining to ride Wonder Horse Ammonia with the rest of the Rollatinis, little Bambino must find another way to contribute to the family business. But performing apart from the others leaves the sixth and youngest Rollatini feeling lonely and left out, even as he flies with the acrobats, rubs elbows with the elephants, and teaches the dancing bear to bicycle. Not only a charming story of a small circus talent finding his place in the troupe, THE FIVE ROLLATINIS also contains a colorful collection of hand-drawn illustrations to practice counting. Young readers will tally lions, tigers, clowns, and many more as they enjoy vibrant images from within the big top. Jan Balet (1913-2009) was a German-born artist best known in the U.S. for his success in the 40s, 50s and 60s as a commercial illustrator in New York City, where he designed for major corporations and publications and authored and illustrated children's books. Returning to Europe in 1965, this self-proclaimed “sophisticated primitive” continued as a children's book author and illustrator, but spent the majority of his final years creating a vast body of work through painting, etching, lithographs, and watercolors. Though out of print for many years, Jan's children’s books Amos and the Moon and The Five Rollatinis are available at Ammo Books!